10pm: We are back at the top of the hour. Democrats are doing well in the House, though it’s not a wave. Florida and Georgia are especially disappointing. It looks like the nation is getting strong turnout from those who strongly dislike President Trump, but also from those who strongly favor him. Some heartening developments, too. Jared Polis was elected the first openly gay governor in Colorado. Sharice Davids is also a gratifying victory. Laura Kelly is a great win in Kansas, defeating Kris Kobach. Democrats estimated to have 80-90% probability of taking House, with an estimated 225 or 226 seats. Republicans will win close Senate races in Texas, Arizona, Florida. Very frustrating. Re-enfranchisement bill in Florida will make a difference. Note: Arizona still too close to call, with slight Democratic edge. House now has 95% probability of Democratic majority. The night looks a little less dour with strong Democratic House victories. Nice governor pickups, too. Especially Walker and Kobach. Michigan, too. Steve King is losing in Iowa. Couldn’t happen to a nicer guy. And as disappointing as the narrow losses in Florida are, the passage of the felon enfranchisement initiative – expanding the electorate by something like 1 million voters – probably makes Florida a Blue state from now on. That’s a big win; try to draw a map where the Republicans take the Presidency without Florida or Pennsylvania. It basically can’t be done. Most of all, the Democrats’ popular-vote edge was somewhere above 8%, just where the pre-election polls had put it. I admit to being disappointed; I thought all the money and enthusiasm and organizing effort would lead the Dems to over-perform. But winning the two-party vote 54-46 means that this isn’t, and never will be, Trump’s country. Good night. It’s still a republic, and we still have to keep it. If you don’t vote, my mom will come to your house. Where she will offer unsolicited, yet eerily perceptive commentary about your relationship and about your BAE. And no. I don’t know what a BAE is. But my mom does. And she just friended yours, on Facebook. An appropriate lead-in to this post is the quote attributed to Stalin: “A single death is a tragedy; a million deaths is a statistic.” This fits very nicely into the structure of information theory, as formulated by Claude Shannon sixty years ago. His measure of information is equivalent to the reciprocal of the probability of occurrence of an event (specifically, the logarithm of this number). That is, if the probability of an occurrence is 100% (1.0), that is, if it’s certain to occur, then its information content is the logarithm of 1, or 0; if the probability is 10%, its information content is 1; if its probability is .001, its information content is 3. In other words, the less likely the event is to occur, the higher the information content of its occurrence. That’s why it’s also called a measure of “surprise,” because the occurrence of a highly unlikely event is more surprising than one that is highly likely to occur. What, pray tell, does this have to do with fear of crime? A lot, it turns out. As Steven Pinker has shown, violence and violent death has declined markedly over the past few centuries, and we are much, much less likely than our ancestors to die at the hands of others, either through wars or by crimes of violence. But this very fact means that (per the quote at the top of this post) each violent death nowadays has a greater surprise value than it did in the past. And that greater surprise value translates directly into greater fear – fear that oneself or one’s family is going to be harmed by others. So we have this paradox: the safer we make ourselves, the more fear we have – of the unknown, of “them” (any outsider), of MS-13, of the person walking toward you (“Quick, get out your gun before he gets his out”). And of course, it is all so easy to stir up fear in a population, especially when those in power, whom we expect to be responsible adults, are the ones stirring it up. To make it easy to follow, I’m using logs to the base 10. For those who slept through math class, the logarithm of a number goes up much more slowly than the number itself, so in the examples above the log of 1 is 0, of 10 (the reciprocal of 1/10) is 1, and of 1000 is 3. End of lesson. Gillibrand stakes out a brave and wonkish position. A progressive group of Democrats, “We the People”, have just held an early beauty contest of five presidential hopefuls and possibles: Senators Cory Booker of New Jersey, Kirsten Gillibrand of New York, Kamala Harris of California, Bernie Sanders of Vermont and Elizabeth Warren of Massachusetts. In this report, I only saw one interesting position. Gillibrand … in response to a question … said she supports a tax on financial transactions. A Tobin tax! It’s a wonk’s dream, tailor-made to appeal to the all-important RBC reader demographic: something like 0.003% of the US electorate, concentrated in a handful of blue states where Ricky the Spider-raccoon on the Democratic ticket would be a shoo-in. It has three other characteristics. 2. Though the tax really does stick it to Wall Street, it won’t be easy to explain this to the Rustbelt voters. How many know there is a highly organised worldwide foreign exchange market, let alone that it turns over $5 trillion a day? 3. The tax is anathema to Wall Street, a huge lobby in Washington and in Gillibrand’s home state, and a major source of political donations. Maybe their counterattack will help with problem 2. 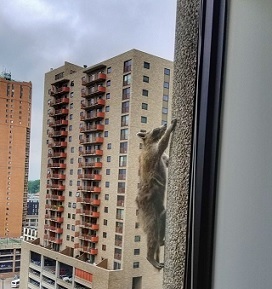 Any Democratic nominee in 2020, whether it’s one of this five or Ricky the Raccoon, will run on the same basic platform: joined-up honest government, expanded health care, fighting climate change, reversing tax cuts for the rich, rebuilding alliances, letting the Dreamers stay. But to get the nomination, the winner will have to mark out something distinctive, in character and policy. Was Gillibrand improvising or flying a kite? She does not strike me as an impulsive politician. Walking back the proposal would damage her chances as a “flip-flop”. It looks to me like a calculated risk, and a pretty brave one. Have any of the other contenders staked out comparable positions on anything difficult? Note on the FX market. The $5trn a day is from here. The real total is higher, as not all trades are cleared through the New York clearing-house. Physical global trade is about $16 trn a year, or $44 bn a day. Add services and long-term investment flows, and you might double that. What economic purpose is served by inflating this 50 times, with banks and dealers taking a cut – a small one, but a cut – on each artificial transaction? The comments thread below confirms my point about the RBC readership. The Tobin tax is public policy catnip to you. Good, but nobody has picked up on the electoral politics. Gillibrand has moved the financial transactions tax from a nice academic speculation to live policymaking. She may well not become President, and may not prioritize the proposal if she does. On the other hand, a successful rival may take it on board – like Edwards’ health plan in 2008 that eventually became ACA. Folks, there is now a decent chance the Tobin tax will happen. Reporters should take an interest. Just who has Gillibrand been getting advice from? I’m sure Shiller, Krugman, Stiglitz, Arrow or deLong would take her calls. Moore voters, in their own words. Come for the race relations were great until President Obama, and the all-the-women-are-lying. Stay for the bonus Soros quotes. There is one consolation: The average age of the voters expressing unfortunate views.Younger people will create a better America. Author Harold PollackPosted on December 9, 2017 Categories Elections, President Trump, Race and Racism3 Comments on Moore voters, in their own words.